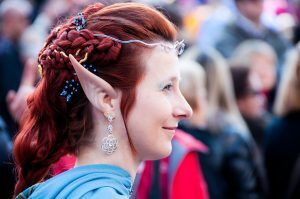 The other mythical source for elves is the Celtic Tuatha De Danaan: since these are usually invisible, this doesn’t help us identify their appearance. When they do choose to appear, they seem indistinguishable from the Celtic lords with whom they interact, during the era in which they are still gods. After the coming of Christianity,.these nature-spirits devolve into fairies. Here are the origins of the Winter and Summer Elves – Lugh becomes Lord of Summer and Morrigan the Lady of Winter. Their appearance tends towards the element of which they are master – so the Lady of Winter has white hair and a crown of icicles. Here the lines blur as to whether they’re elves at all. At one end of a story-spectrum you have elementals – beings made of an element, who are usually only semi-sentient. At the other you have Tolkien’s elves – which are essentially humans-plus. Wood Elves live close to nature, and their eyes, whilst sharp, are the most normal of the races. Tending to brown and green shades, they have ordinary sized pupils. The Shadar Kai became elves – the shadow elves – as they seemed more elfin than human. They are those elves of any sub-race who spend sufficiently long in the world of the dead to partake of its nature. Their eyes become misty portals – dark swirling and enchanting. The Desert Hags were a new race, tied to the sand and the heat, and their eyes had no pupil, instead having large brilliant irises that somehow filtered the light entering to keep the sun from blinding them. So there you go. Varietals of elves, identifiable with a good Spot check, but not quite as racist as the original. Trivial illusion magic, or even a good disguise, allows any elf to masquerade as any other kind of elf, but they still require an ear-bob – or a more extensive illusion – to appear human. Fire-elves and wind-elves? We went all Arabic, and called them ifrits and djinni. What color are those elements? Handing the ball over to Ste for that next week.